The best fresh organics, vegan, and nutritional foods and supplements are available. Our inventory is always changing, growing, and expanding as our search for the best continues. Here are just a few highlights from our great selection. Nature’s superfoods are combined with the richness of a truffle, for a great energy bite that is healthy and great tasting. We’ve got ’em in several flavors including mint creme, peanut butter, and coco macadamia and chocolate hazelnut. Eat a few Mint Creme Truffles and you’ll be transported to the peak of a snow-capped mountain—or perhaps you’re already traversing the Alps and the Truffles are fueling your adventure. 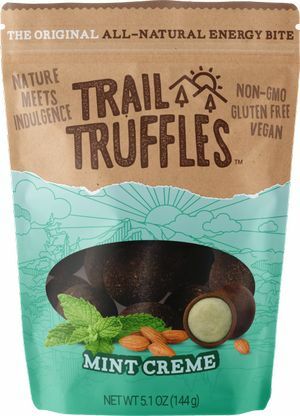 Please be forewarned: these Truffles will make you feel so cool and refreshed that you may not realize you’re at max heart rate on your trek, so please indulge responsibly. This complete bioavailable protein has a balanced neutral flavor and offers a full spectrum of amino acids along with Iron and Dietary Fiber. 30 serving tubs in three natural flavors. 15g-17g of protein per serving. Steadily absorbed over time, making it hunger satiating and energy sustaining. Organic, Vegan, and Kosher to match any dietary profile. Ultimate Green Protein is a plant-based blend with a key balance of vitamin rich greens, microalgae nutrients, and protein to help mineralize and alkalize the body. 30-serving tub and single serving packets available. 15g of highly digestible protein per serving. 100% Daily Value of Vitamin A as well as Iron, Calcium, Dietary Fiber, and Potassium. Includes truly green sources of protein to help promote muscle tissue and cellular repair. Complete source of essential and non-essential amino acids. Contains beneficial Omega 3 and 6 fatty acids. OJIO Organic Coconut Syrup is a sweetener derived from the nectar of coconut blossoms grown and tapped by local farmers in the Philippines. It has a decadently rich natural aroma and a flavor similar to honey and is a deep golden brown. It is not mixed with any bleaching ingredient and as the syrup ages the color slowly darkens as a natural characteristic. As a raw, unrefined sweetener, Coconut Syrup has a relatively low glycemic rating, making it a preferable choice for those seeking to manage their blood sugar levels. To produce Native Forest Coconut Milk Powder, we spray-dry fresh coconut milk, adding only plant-based ingredients to protect, disperse and balance nutrients when the milk becomes powder. There are no other ingredients. What is unsweetened Fire Cider? To the base of certified organic apple cider vinegar, we’ve added whole, raw, certified organic oranges, lemons, onions, ginger, horseradish, habanero pepper, garlic and turmeric. We let this mixture steep for 6 weeks at room temperature, to preserve the living vinegar culture and delicate flavors of the ingredients. The result is potent but balanced, offering layers of tart and spice. are grown in lush organic orchards on the beautiful island country of Sri Lanka. Big and prickly on the outside, young jackfruit’s fleshy interior has a mild flavor and meaty texture that’s remarkably similar to chicken or pork. As such, it makes an excellent vegan, soy, and gluten-free meat substitute in your favorite dishes and recipes. As it cooks, this jackfruit begins to flake or shred into the ideal texture for vegan “pulled pork” or “chicken” recipes. With a mild flavor, it’s easily adaptable to whatever spices, sauces and seasonings you incorporate so that much like tofu, it provides a great versatile way to bring the texture you want for your meals without the animal ingredients. Oreganol P73 from North American Herb & Spice – NEW! P73 is the only certified-wild Mediterranean oregano oil It is made by oregano experts from North American Herb & Spice, who first introduce edible oil of oregano to the North American market. Essential oil is made only from wild, mountain-grown Mediterranean oregano, free of all chemicals and pesticides to make it edible. It is also emulsified in carrier oil such as extra virgin olive oil. The only oregano used is the real, 100%-wild Mediterranean oregano, guaranteed to be handpicked in pristine and untarnished remote mountains. It is produced by old-fashioned steam distillation, using deep spring water also known for its high mineral content. There are no chemicals or solvents used in the extraction process. Oreganol P73 is a specific combination of several high-grade medicinal wild oreganos. It has a high percentage of essential minerals such as calcium, magnesium, and zinc, which are absorbed from the mineral-rich soil that it grows in. Oreganol P73 comes in oil and gelcap form, as well as in regular and super strength, which is three times stronger than the regular. It is available in .45 fl oz and 1 fl oz. Wild Power Tea from North American Herb & Spice – NEW! Wild Power Tea is truly wild, handpicked from mineral rich soils and a non-GMO. It is the rarest tea possible because it is all handpicked from remote regions in the wilderness. It is 100% wild. Wild Power Tea has a lovely taste comparable to a regular tea but it has caffeine at all. ChagaBlack Tea from North American Herb & Spice – NEW! ChagaBlack tea is the original wild forest coffee substitute. It is a nutritious special concentrate of wild black chaga plus wild rose hips and birch bark. It is more healthier than coffee since it’s a potent source of antioxidants, an exceptionally high ORAC value. ChagaBlack tea is also a dense source of sterols, polyphenols, betulin, and betulinic acid, plus vitamin C from rose hips. It is a good source for essential trace minerals such as copper, iron, magnesium, and potassium, as well as B vitamins, especially pantothenic acid—the adrenal nourisher. ChagaBlack tea is also the top source of the potent antioxidant enzyme SOD (superoxide dismutase). Chag-o-Charge Tea from North American Herb & Spice – NEW! Chag-o-Charge Tea is a very rare, delicious wild chaga mushroom health drink which is made from wild raw white birch bark and organic purple maca root. This special mushroom grows on wild birch trees and is a kind of hard growth. Unlike any other mushroom, this mushroom acts to heal the tree. Drink this for a better health because it is the top source of natural B vitamins plus the all-important antioxidant enzyme SOD. And also a natural source of beta glucan, minerals, and powerful plant sterols. Chag-o-Charge tea is a definite health drink like no other. Raw, Live and Purified Aloe Juice This aloe juice is purified for daily use and it tastes good. It is well processed to protect and deliver the full benefits of Aloe. The magnificent Aloe plant, that is designed to be self sufficient and thrive in the dessert, feeds us in unique ways with its 250+ naturally occurring constituents including: enzymes, amino acids, essential fatty acids, vitamins, minerals, glycoproteins, sterols, growth factors and Aloe’s unique growth polysaccharides and glucomannans. 70 Recipes for Grilling, Chilling, Searing, and Serving on Himalayan Salt Blocks Mark Bitterman is a best-selling author of “Salted” Everyone who loves the excitement and pleasure of discovering new cooking techniques will enjoy this guide to cooking and entertaining with salt blocks. Rosas has crafted a variety of products for you to experience the benefits of organic, fair-trade Egyptian hibiscus, raw organic turmeric and raw organic ginger! Make the base for your own refreshing, energizing beverages with Hibiscus Concentrate. Authentic 100% Pure & Natural Bulgarian Rose Water Bulgarian Rosa Damascena Rose is recognized as the finest rose in the world with an enormous health and beauty benefits. It is organically grown in the “Rose Valley” in Bulgaria. Fresh organic rose petals are hand-picked from the rose fields in the morning while the dew is still on them. They immediately undergo a very meticulous steam-distillation process. The water which condenses and drips into a collecting vessel is called Rose Water. You could apply it on your body or hair or take it internally in the form of organic Bulgarian Rose Water to experience a vast range of therapeutic benefits because of the presence of numerous water-soluble active ingredients that are not present in the rose oil itself. This is a raw and organic Kombucha which uses premium Oolong and Yerba Mate teas brewed in spring water and proprietary culture to create a luscious beverage of nutritious beneficial enzymes, probiotics and organic acids. It will detoxify, energize and balance with nutrition your body craves. Reed’s Kombucha Lemon Ginger Rasberry Flavor Ingredients: Live organic Kombucha (spring water, organic evaporated cane juice, organic oolong tea, organic yerba mate tea, kombucha culture) organic fresh ginger root, organic raspberry juice, organic raspberry puree, organic lemon juice. Free of Preservatives, Gluten & GMO’s. Passion Mango Ginger Flavor Ingredients: Live organic Kombucha (spring water, organic evaporated cane juice, organic oolong tea, organic yerba mate tea) organic fresh ginger root, organic passion fruit juice concentrate, organic mango juice concentrate, organic orange juice concentrate. Free of Preservatives, Gluten & GMO’s. Each of our creative flavors blend our raw Kombucha with ingredients that are uniquely delicious and very functional. Norwegian kelp is brown algae, found along the North Atlantic coast from Svalbard (a group of tiny islands in the northernmost part of Norway) right down to Portugal. It is considered to be less contaminated by toxins since these waters are protected, clean and pristine. What are the benefits of Kelp? Suggested use is 1 tsp. per day or twice a day and one bottle is a 3 month supply. A versatile and fun fudge spread. Lovebean is an incredibly rich, creamy, vegan, organic chocolate spread made with all the benefits of coconut oil. It is sweetened with low-glycemic coconut nectar. This luscious spread is gluten and soy free. A perfect spread you will surely enjoy with fresh fruit, ice cream, smoothies, coffee, waffles and bread. Ritual Wellness is the purveyor of Southern California’s premier organic juices. Provides superior 100% USDA certified organic, raw and & freshly cold pressed juices that are hand crafted to perfection. A line of juices for everyday nutrition on the go. What is Ritual Juice? It is the most convenient and delicious way to optimal health without depriving your body of the nutrients it needs. This is a remarkable real-food supplement allowing consumers to easily integrate 100% organic, raw fruits and vegetables with flavor and filled with healthy vitamins into their daily diets. Chlorophyll packed green blends that are pressed from 3 + pounds of 100% organic veggies in each bottle, will surely elevate your diet to a higher level. Consumers will have better digestion, increased energy and stamina, better skin tone, decreased inflammation, improved circulation, gentle detoxification and healthier eating habits. It is recommended to drink a green upon rising for an amazing start or midday as a healthy snack. Add this refreshing, antioxidant lemonade to get a well-balanced daily diet. It fights acidity and gives a healthy dosage of vitamin C. Definite outcome may include stimulated liver function, elimination of excess water, decreased mucus, balanced pH levels, enhanced digestion and reduced cravings. It is recommended a great replacement for an afternoon snack. Kill cravings and curb your hunger between meals with a hydrating and refreshing lemonade. Mylks are perfect vegan meal substitute or intense workout recovery drink because they are dense and protein-rich. Consumers will be benefited with decreased cravings, replenished minerals and increased athletic performance. It is recommended to drink a mylk in place of a meal, to curb the desire for a rich dessert or as a workout recovery. Call us or come on in to see which items are currently stocked. 100% natural, wholesome and delicious Himalayan Salt! This traditional Ayurvedic healing black rock salt is hygienically hand-cleaned and crushed using non-painted stainless steel, in a Nepali government-approved Fair Trade facility. Free from contaminants, heavy metals, or allergens. Our black salt was mined in the unpolluted Himalayas but never undergone any chemical processing. This salt contains high levels of beneficial sulfur (and many trace minerals). Sulfur plays a vital role in our body especially in reducing the harmful effects of toxic heavy metals and other chemicals. Delicious tasting and healthy sulfur-rich salt for any raw and cooked foods. All the proceeds from this RAW SALT sustain the Everest Learning Academy of Nepal, a non-profit network of rural schools, child care centers, & orphanages that nurture, educate, and protect the poorest children of Nepal from child trafficking, slavery, and prostitution. Contains heirloom tomatoes which have a unique flavor, perfected over centuries and it is evident in the robust flavor of this ketchup. Kaught up Ketchup is a Veteran owned and operated small business with plans to market locally with the intention of marketing online throughout the country. Bell Purple – Made with organic Cherokee Purple heirloom tomatoes as well as organic red bell peppers. This is a sweet ketchup with a robust flavor sweetened with agave nectar using no artificial preservatives. Chipotle – Made with organic tomatoes and organic red bell peppers, than spiced with organic Chipotle pepper giving this a sweet, nutty and smokey flavor sweetened with agave nectar using no artificial preservatives. Gluten and allergen free! Lesaffre leads the industry with RED STAR Nutritional Yeast, which has set the standard for quality and innovation for generations. With its roasted nutty flavor, RED STAR Nutritional Yeast has been a favorite among consumers since its introduction in 1975. Naturally high in protein and fiber, while low in fat and sodium, RED STAR Nutritional Yeast offers a perfect way to add extra nutrition to your diet – without preservatives, artificial colors or flavors. RED STAR® Nutritional Yeast is NOT brewer’s yeast, a by-product of the brewing industry that has an inferior nutritional profile compared to primary-grown yeast and that must be further processed to remove the bitter taste of hops. Many people find that nutritional yeast has a smoother, more “cheesy” taste than brewer’s yeast, which tends to be bitter even after processing. Additionally, because nutritional yeast does not come in contact with barley (like brewer’s yeast), it is gluten-free and safe for people with Celiac disease. What is Aroniaberry? Nature’s healer and protector, the aroniaberry was highly valued and utilized by Native Americans, who considered the berry to be an essential part of their daily health needs. A hearty plant, aroniaberry (chokeberry) bushes once thrived throughout much of North America. They disappeared, only to resurface and grow in popularity throughout Eastern Europe in the 1800s. Today, we are seeing a resurgence of the growth of aroniaberries in North America, as this tiny but powerful berry takes center stage among the superfruits. The aroniaberry is making its way into the diets of those who seek alternative health choices and fresh foods that contain multiple benefits for overall wellness. Learn more at Superberries.com. Pure Concentrate. This is a highly concentrated version of the raw berry in a convenient juice form. To maximize the full benefits of Aronia, mix 1 1/2 teaspoons of Superberries Aronia Concentrate into 8 oz. of water or beverage of your choice, twice daily. This is a quick and easy way for you to get your daily supercharge of powerful antioxidants. One 16 fl oz (474mL) bottle is a 32 day supply. Growing Naturals brand organic rice protein, in vanilla and chocolate flavors. 24 gram packs Great Whey Substitute – 96% correlation to whey protein’s amino acid profile but better yet, minus the dairy and allergens. As the Only Rice Protein Isolate, you get more dairy-free protein per scoop for your buck, at 90% levels and fewer carbs. In fact, it’s double what most competitors offer at 24 grams / serving of bioavailable protein. Using raw proteins, we boost digestibility and energy production. And it’s the only protein source endorsed by the Celiac Disease Foundation. Growing Naturals’ proprietary process creates a non-chalky, silky texture, leaving consumers wanting more. And best of all, it’s Certified Organic: Consuming organic is part of a healthier and more environmentally friendly lifestyle. The Emperor’s Exclusive Grain, Imported from China. Now grown organically, our most popular rice is fabled to enrich health and ensure longevity. This medium-size heirloom rice is treasured for its delicious roasted nutty taste, soft texture and beautiful deep purple color. Extremely high in a class of flavonoid antioxidants called anthocyanins, Forbidden Rice® is also rich in iron and, according to Chinese herbal medicine, considered to be a blood tonifier. A striking presence on any plate, this once forbidden indulgence is now a wholesome everyday rice. It pairs beautifully with all cuisines – use it steamed plain, in a pilaf, stir-fry, salad or pudding. As many antioxidants as blueberries? A new study shows that a spoonful of black rice bran or 10 spoonfuls of cooked black rice contains the same amount of antioxidants as a spoonful of fresh blueberries. Click here for more information. For only $0.50 a serving, this rice provides the richest nutritional value, providing a higher level of vitamins, minerals and fiber of any bran rice, as well as a comprehensive range of amino acids, proteins, vegetable fats and essential trace elements needed by the body. One of the first rices we brought to the US, it took ten years, but now Forbidden Rice® is grown organically for us on hundreds of small family farms in the Black Dragon River (Heilongjiang) region of China’s sub-arctic Northeast provinces. Discover the delicious, nutritious and revitalizing wonders of this 100% pure and natural, dairy-free, sugar-free, gluten-free, soy-free and certified vegan living food. inner-ēco™ Coconut Water Probiotic Kefir is hand crafted and made in small batches using freshly harvested coconut water from young green (less than six months old) coconuts at the peak of their nutritional life. And yes, we crack the coconuts and harvest the water ourselves to guarantee its freshness! What is kefir? Lab tested to contain boundless amounts of live, probiotic cultures per serving, this kefir is a living food created to build and nourish the inner ecology of your body. With seemingly endless health-supporting properties, inner-ēco™ Coconut Water Probiotic Kefir is an essential ally in your quest for optimum health. Learn more at inner-eco.com. A unique, raw, plant-based protein with a complete amino acid profile, exceptionally high in Glutamine, Arginine, Lysine, Luecine, and branch chain amino acids. An easily-digestible, nutrient- dense superfood, perfect for those who want to be ultra-healthy and fit. Best of all – It tastes phenomenal! WARRIOR BLEND is green, plastic-free, hypo-allergenic, and suitable for any diet or lifestyle (NOT JUST FOR VEGANS)! The Highest Vibrational Greens on the Planet! Raw & Organic, Non-GMO, Gluten-Free, 100% Organic, 100% Delicious! Ingredients Oat Grass – We use oat grass in our formula because it picks up the highest amounts of Noble Elements and ormus from the soil. Oat grass is used traditionally to help build sexual stamina. Oat grass (Avena Sativa) has a relaxing and stimulating action that nourishes and strengthens the nervous system.Barley and Wheat Grass- Barley and wheat grass are both loaded with high trace minerals, calcium, iron, all essential amino acids, vitamin C, the flavonoids, and a number of enzymes and minerals. They also contain superoxide dismutase (SOD), a powerful antioxidant enzyme that protects the cells against toxic free radicals. All the cereal grasses pick up ormus from the soil. Alfalfa – Alfalfa is a plant which sends its roots down twenty to thirty feet into the ground and brings up the minerals that are not available on the surface. For this reason, the Arabic word Alfalfa means “father of plants.” Alfalfa is rich in vitamins, minerals and other nutrients that play a vital role in the strength and growth of our bones and in the maintenance of a healthy body. It contains protein and vitamin A, vitamin B1, vitamin B6, vitamin C, vitamin E, and vitamin K. It also contains calcium, potassium, carotene, iron, and zinc. Yucca – Yucca are desert plants that are part of the Agave family. We wild craft our own wild Yucca plants in the high desert in a way that promotes growth for the other plants. Yucca extracts may have anti-arthritic and anti-inflammatory effects including anti-fungal and anti- protozoal activities. Yucca is also a rich source of phenolics, including resveratrol and a number of other stilbenes (yuccaols A, B, C, D and E). Yucca extracts and its phenolics are also anti-oxidants and free-radical scavengers. Parsley – Parsley is perhaps one of the most commonly used but therapeutically under-rated of herbs. Parsley is very high in bio available vitamin C and is a good source of manganese, calcium and potassium. It also contains flavonoids that act as antioxidants. Parsley is also rich in vitamin A, well-known for its effects on vision, plus can mitigate risks of atherosclerosis and diabetes. Parsley cleanses the blood, dissolves sticky deposits in veins, maintains elasticity of blood vessels, facilitates removal of moderately sized kidney and gallstones, treats deafness and ear infections, and benefits the sexual system. Parsley helps with bad breath and is one of the most important herbs for providing vitamins to the body. It’s like an immune-enhancing multi-vitamin and mineral complex in green plant form. Spinach – Spinach is a rich source of protein, minerals, vitamins, pigments and phytonutrients. Health benefits of spinach are due to presence of vitamins, pigments, phytonutrients and minerals like potassium, manganese, zinc, magnesium, iron and calcium. Spinach is a source of vitamins like folate, niacin, vitamin A, B6, C and traces of the rest of the vitamins. Other important elements, including thiamine and riboflavin, that are used in various reactions in our body are also found in spinach. Spinach is rich in pigments like beta carotene, lutein and xanthene and chlorophyllin etc. Probiotic Culture – We use a “live active culture” process with part of our cereal greens. This is different from other companies who just mix Probiotics into their greens. Traditional Probiotic foods include: yogurt, kefir, miso, and sauerkrauts and are very good for the body and digestive tract. Science has learned that cultured foods are easy to digest and create life-enhancing nutrients. Peppermint makes our greens easy to drink and very palatable. Peppermint is also an age-old herbal medicine that has been used to treat a wide range of abdominal woes, from flatulence to stomach cancer to gallbladder disease. Several studies have shown that peppermint seems to be fairly effective at relieving irritable bowel syndrome (IBS), a collection of symptoms that includes abdominal cramping and pain, bloating, constipation, and diarrhea. Peppermint also has anti-parasitic properties and has been used in folk remedies to get rid of parasites. Whole Leaf Stevia – We use the whole leaf stevia herb which has been used for centuries in South America to aid diabetics and hypoglycemics. Research has shown that a whole leaf stevia herb has a regulating effect on the pancreas and helps stabilize blood sugar levels. Herbal stevia is therefore useful to people with diabetes, hypoglycemia, and Candidiasis. Other traditional uses of herbal stevia are to lower elevated blood pressure (hypertension), as a digestive aid that also reduces gas and stomach acidity, and for obesity. The herb acts as general tonic which increases energy levels and mental acuity. The stevia herb has also been shown to inhibit the growth and reproduction of bacteria that cause gum disease and tooth decay, making it an excellent addition for the teeth and gums. We have a great selection of 100% organic, raw, gluten free, vegan coconut products from Coconut Secret. Virgin Oil de Coco Creme From First Quality Organics By far the best brand of coconut oil or coconut butter. It has a fresh, mild coconut flavor, with just the right balance of texture and substance to your raw desserts. Touted as a metabolism boosting secret ingredient for losing weight by many people. This unrefined, certified organic, cold-pressed virgin oil is not only good for your insides – it’s great on your skin as a lotion or wash because of its antiseptic and antioxidant properties it is superb for rejuvenating dry, stressed and aging skin as well as delicate skin. Essential for raw food living! Ingredients: Certified* organic, cold-pressed virgin coconut oil. *Certified ISO, HACPP, Kosher, Halal, AIB, GMP, NOP-USDA, OCCP, EU and JAS. Living 100% Raw Vegan, 85% Pure Protein, *Complete Amino Acid Profile, Hypoallergenic, Non-GMO, Gluten Free 3 Great Flavors: Vanilla, Chocoloate, Natural At 85% protein, Sunwarrior has the highest (non soy) raw (not heated over 90 degrees ) whole grain sprouted vegan protein on the market. By using a third generation process, we have created the best tasting vegetable protein on the market that has a silky smooth texture that blends well and tastes great compared with other chalky and grainy vegetable proteins. We use old world process of combining the sprouted endosperm and the bran from raw sprouted whole grain brown rice. This unique process creates the first complete hypoallergenic protein which is made up of all 9 essential amino acids and other non-essential amino acids in a perfectly balanced amino acid profile. 98% correlation rate to Mother’s Milk and a 98.2% digestion efficiency making it one of the highest digestibility and efficiency ratings of any other protein sources (compared to whey and soy). Highest Net Protein Utilization score of any vegetable based protein and the highest ratio of amino acids converted to proteins. Increases efficacy and absorption of vitamin, minerals. There has been a direct correlation between the use of Sunwarrior Protein and the absorption of vitamins. Because Sunwarrior Protein is so digestible, it can be easily assimilated by infants, the elderly and adults The World Health Organization may be using Sunwarrior Protein in the future to feed malnourished individuals, because of the hypoallergenic profile, and superior absorption that Sunwarrior has shown to have. There is currently a clinical trial which shows promise that Sunwarrior Protein aids in the absorption of vitamins in Aids patients. There has been a direct correlation between the use of Sunwarrior Protein and the absorption of vitamins where other proteins do not provide such synergistic affects during intake. Weight loss clinical studies in Japan have showed that by providing rice protein as a staple in a diet, that it can be used as a weight control vehicle especially, because of the superior absorption rates. Diabetes- There are clinical studies going on right now which show that because of the balanced nutritional profile of rice, it helps to actually maintain the diabetic affects of sugars, which could be used in diabetic products to help control insulin levels. Cholesterol- Clinical studies have shown promise that Sunwarrior has cholesterol lowering potential and the USDA is currently using Sunwarrior in trials to see if it, it may help control high blood pressure. In Chocolate, Vanilla, and Natural flavors. Bariani Organic Extra Virgin Olive Oil – from California! The Bariani family follows their lineage from Italy to produce wholesome, organic olive oil the traditional way. Bariani Olive Oil is committed in producing an authentic extra virgin olive oil which is raw and once only available thru the turn of the century. Produced in a limited quantity, the olive oil is a registered organic product and with the particular and discriminatory taste of the family, the quality is always guaranteed. California grown organic exra virgin olive oil in 3 great sizes, 1L, 500ml, 250ml. It’s bottled in dark green bottles to protect the powerful and delicate live nutiruents of this fine oil. We have some the finest Himalayan salt for great taste and the nutritional minerals your body needs to perform at it’s optimum. We carry table and cooking salt, course and fine grain salt and salt mills. The healthiest salt on earth! Healthier than sea salt! Delicious tasting and rich in minerals. Himalayan Salt is the purest salt in the world. Free of bleaches, preservatives, and chemical additives. It has more than 94 minerals and trace elements. This gourmet-grade salt adds a burst of flavorful energy to your cooking. Himalayan cooking salt is unprocessed, contains no environmental pollutants, and has never been “commercially cleaned” or baked like traditional table salt. Available in coarse pieces in shakers or table salt grinders. Cooking Tray and Cooking Slabs. Healthy, vegan, gluten free, gourmet seasoned, gently air dried, natural snacks. Gone Nuts! Raw & Sprouted Nut Blends are full of flavor, life and fun. Great flavors include spicy chipolte, sun dried marinara, cilantro limone, and include ingredients like almonds, pistachios, walnuts, cashews, and white chocolate. Ojio Cacao Nibs are whole, pure and raw, virgin chocolate which are made from the native-born heirloom Ecuadorian species of cacao bean Arriba Nacional-Fino de Aroma. This variety of Cacao is considered worldwide to have the finest floral aroma and flavor profile. It has highest amount of bio-available nutrients and minerals. This is made from hand peeled beans and has never undergone machine processed. A quick chocolate snack. Raw Organic Cacao Butter Ojio Cacao Butter from Peru is derived from the Forastero family of cacao beans which is considered the most recognizable chocolate flavor in the world. It contains 22% fat content per serving. This Peruvian butter has a robust full flavor, less oxidation, and many nutritional benefits. It is used to add robust flavor to many dessert and chocolate bar recipes. The statement on this product has not been evaluated by the Food and Drug Administration. This product is not intended to treat, diagnose, cure or prevent any disease. Learn more at myojio.com. Macro Greens® Macro Greens® is a non-allergenic nutrient-rich super food supplement that optimizes pH for stimulant-free health and surpasses the nutrition of five servings of fruits and vegetables without the calories or carbohydrates. The benefits of using Macro Greens® daily include increased energy, weight loss, increased mental clarity, balanced blood sugar, strengthened immune system and improved digestion. Miracle Reds® Miracle Reds® Super Fruit Anti-Aging Blend provides a full spectrum of antioxidant protection. It contains key compounds that help mop up unstable free radicals that damage healthy cells and cause premature aging. Miracle Reds include Goji berries, Pomegranate, Acai, and Mangosteen! Rawnola Soaked Nuts and Seeds, Low Temperature Dried! Ingredients: *Coconut, *Almonds, *Pumpkin Seeds, *Figs, *Real Raw Agave Nectar, Sun-Dried Sea Salt, *Cinnamon, *Ginger, *Vanilla Bean. (*organic) Goji Bar Soaked Nuts and Seeds, Low Temperature Dried! Ingredients: *Coconut, *Almonds, Goji Berries (wild crafted), *Figs, *Real Raw Agave Nectar, Sun-Dried Sea Salt, *Cinnamon, *Vanilla Bean. (*organic) Rawnola Bar Soaked Nuts and Seeds, Low Temperature Dried! Ingredients: *Coconut, *Almonds, *Pumpkin Seeds, *Figs, *Real Raw Agave Nectar, Sun-Dried Sea Salt, *Cinnamon, *Ginger, *Vanilla Bean. (*organic) Yogi Bar Inspired by the wisdom of ancient masters as a prescription for more than just a sense of well being! Soaked Nuts and Seeds, Low Temperature Dried! Ingredients: *Coconut, *Sesame Seeds, *Pumpkin Seeds, *Figs,*Real Raw Agave Nectar, Sun-Dried Sea Salt, Lemon, Turmeric, Ashwagandha, Shilajit. (*organic) Visit EarthlingOrganics.com to learn more.